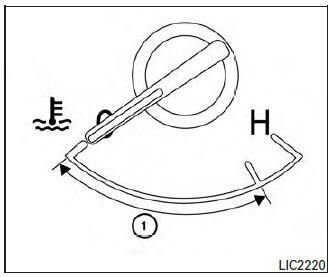 The engine coolant temperature is within the normal range 1 when the gauge needle points within the zone shown in the illustration. If the gauge indicates coolant temperature near the hot (H) end of the normal range, reduce vehicle speed to decrease temperature. If the gauge is over the normal range, stop the vehicle as soon as safely possible. If the engine is overheated, continued operation of the vehicle may seriously damage the engine. For additional information, refer to “If your vehicle overheats” in the “In case of emergency” section of this manual for immediate action required.